Ebony Smith is on a mission to make wellness accessible to all—and it’s working. All images courtesy of Yoga N Da Hood. Meet Ebony at the Wanderlust 108 in Dallas on April 13! For tickets and more information, click here. Ebony Smith—aka the Ghetto Guru—came to yoga through an unlikely portal: Ricki Lake. At the time, Ebony was married to a man she didn’t even really know, and was pregnant with her first child. Life in her Dallas neighborhood was strained at best, and Ebony stressed about opportunities she’d be able to provide her baby. When she learned about natural childbirth in a documentary produced by Ricki Lake—and that the state of Texas had recently allowed for Medicaid to cover natural childbirth—she realized it was a something she could do for her daughter right out of the womb. “That’s how I found the doula,” Ebony says. “And the doula was like, ‘Yes, girl. You’ve got to go to yoga.’” So she did. “When I stepped on the mat, that was the first time I had met Ebony and who she was,” she says, “and as I continued to practice, who she could be.” Ebony realized that if she plugged into herself, she could empower herself to change her thoughts—and that in turn could change her life. This realization provided self-healing that Ebony hadn’t expected or experienced. “I thought, oh my god—people in our community need that, and it’s just not accessible,” she says. And so Ebony went on a mission to change that. Yoga N Da Hood was born. 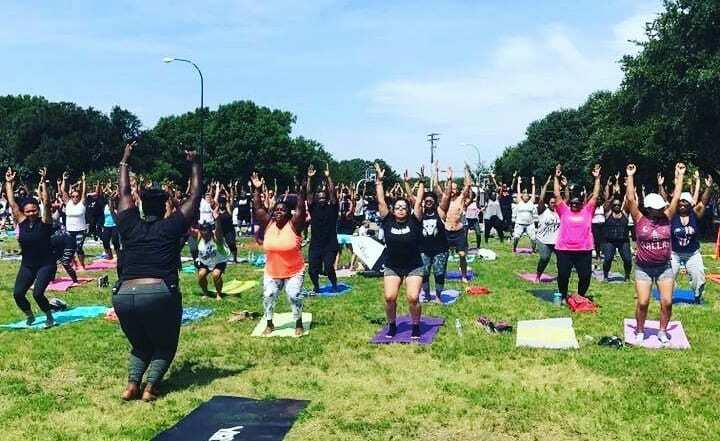 Now in its eighth year, Yoga N Da Hood is a growing non-profit that provides accessibility to wellness programs for underserved neighborhoods in Dallas, with outreach programs that teach the art of self-talk and self-love alongside traditional mindfulness practices. The organization currently serves upwards of 150 people every week, having grown from its roots of free yoga classes in the park. “Some people would come, some people wouldn’t—and it just kind of grew from there,” Ebony says. “Now we have after-school programs where we do mindful movement, yoga and mindfulness, and self-regulation. We also host four free yoga classes every week in different areas of the community,” she says. The organization is currently raising money for its newest project: Converting retired school buses into mobile yoga studios for kids. It’s no secret that yoga in the West has, in recent years, been popularized in the mainstream and on social media through the cultivation of a certain aesthetic—one that’s dominantly white, beautiful, lithe, and curated. According to fitness.com, the average cost of a drop-in yoga class across the country is $12, which can be prohibitive. Ebony says that in underserved communities there’s a pervasive stereotype that things that are good—things that are good for you—are only for people of privilege. This becomes a self-fulfilling prophecy. “A lot of times you go into a yoga studio—if you can even get into a yoga studio—and there’s no one there that looks like you,” says Ebony. To boot, typical yoga studios, with their music and incense and dark lighting and Om-ing, can be intimidating to someone who’s never seen it. And sometimes, well-intentioned teachers and studio owners can exacerbate the problem: Ebony recalls a time when she entered a studio and was gently informed that the class she’d signed up for was advanced and “Wouldn’t she rather take the restorative?” Part of the Yoga N Da Hood mission is to break down these kinds of stereotypes using different kinds of music, reaching out to people from all backgrounds, and teaching outside of these traditional spaces. You’re not powerless. It’s in your mind, it’s in your thoughts, and if you can change your thoughts, you can change your life. Ebony didn’t come to this conclusion in a void. Though she had been practicing for a while, it was when she lost her house that she truly realized the power that yoga had taken over her life. She knew that she could always take her children and go live with her mother, but in the past, she says her ego wouldn’t allow her to accept that kindness. In the past, “it would’ve been a spiral of drinking and not making good choices,” Ebony says. “I noticed it was a turning point—I felt I had a choice. In this moment I had a choice to make my life better; I could go home to my mother who is alive and well and willing to take care of us. Or I could drink booze and not be responsible for my own actions.” Living from an embodied place come to through her practice, Ebony was able to make the choice to ignore her ego and do what was best for her family. This is one reason why the mission of Yoga N Da Hood doesn’t stop at yoga. Access to wellness isn’t just about practice—it’s also about education and lifestyle. “It takes a certain level of mindfulness in order to transform your life,” she says. A lot of the neighborhoods Yoga N Da Hood serve are food deserts, says Ebony, with convenient stores on every corner. Once a person is exposed to wellness and mindful living, they are more apt to make healthy decisions. For example, Yoga N Da Hood helps to educate people on how to use their food stamps to make better choices‚ even in a food desert. “No, Hot Takis are not part of your child’s diet staples; you don’t have to fill up your basket with Little Debbie’s,” laughs Ebony. In that vein, Yoga N Da Hood hosts workshops, and partners with various other organizations to teach people how to cook healthy food, for example. Last summer, they held a small wellness festival and brought in experts to talk about heart disease and diabetes, and how yoga could help address these issues. It takes a certain level of mindfulness in order to transform your life. And it works. Ebony says that sharing success stories of the community she’s fostered is one of her favorite things to talk about. People approach her often to tell her that the program has changed their lives. She was recently teaching a workshop for educators, and there was a participant she didn’t recognize. The woman came up to her after the workshop to tell Ebony that she’d been taking her yoga classes, and had lost 150 pounds. “Not only was it the yoga classes,” Ebony says, “but it was how she had transformed her whole life, how she ate, and how she fed her children. We get that a lot. Or, you know, kids say ‘I feel good about myself. I feel relaxed.’ Those are the kinds of things that keep me doing what I’m doing because it solidifies the fact that it’s working,” says Ebony. Though Yoga N Da Hood offers classes that do resonate with underserved communities, Ebony is a firm believer that wellness is for everybody. She notes that everyone experiences trauma in life—and though some may be worse than others, none are by any means “less than” for the person going through the trauma. Yoga N Da Hood is a kind of gateway for people to explore programs that can make them healthier and happier—whoever they are. It’s not just black people, she says, and not just for poor people. “We have everybody come to our classes from all walks of life, just to be encouraged and learn to be well—whatever that means for themselves,” says Ebony. Try not to make it so “yoga-studio-like!” Consider limiting the number of religious deity statues. Have some classes on the schedule that deal more with breathwork than rigorous poses. Send teachers to diversity trainings! 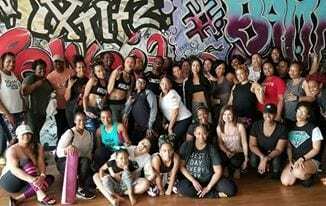 Offer non-traditional classes, like R&B-themed classes. Host monthly donation-based community classes. Donate to the Mindful School Bus!